WOW! What a day the Poling Estate Auction turned out to be on September 21, 2013. Sporadic heavy & light rain came down on the Hammer Time Auctioneers but they never waivered from what they were there to do...get Mrs. Poling as much as they could for the items she had to sell! 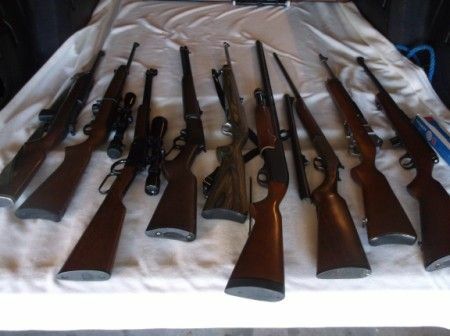 The fast paced bidding caused the rifles, shotguns, pistols & knives as well as all the other items to bring in high bids and Mrs. Poling was a happy person at the end of the day. ** Note ** The guns and knives will not be on site until the day of the auction. 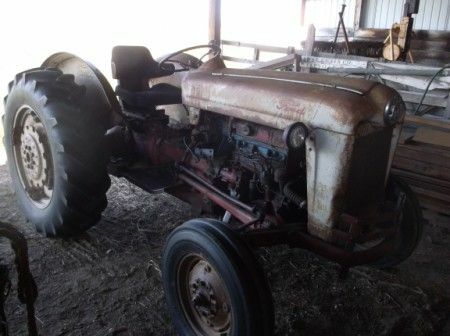 FORD 4630 Tractor, 1 owner knee deep in rubber showing 289.5 hrs w/7209 Loader; FORD 800 tractor; (2) CONTINENTAL 3 pt. PTO post hole diggers; DANUSER dolly cart mounted post driver (gas motor); NEW IDEA manure spreader; hay wagons; PALCO cattle chute; 6' 3 pt. hitch PTO rotary mower; 3 pt. RHINO blade; 3 pt. rd. bale carrier. VEHICLES: 2000 DODGE SLT Laramie RAM 4x4 extended cab, navy blue, auto pwr windows, locks, AC, cruise, showing 67,291 miles; OLDSMOBILE Toronado 2 tone brown exterior, cloth seats, showing 18,402, fully loaded GUNS: COLT Cobar .38 Special; S&W 6 shot .22; S&W US Navy .38 Special; REXIO .22 revolver 9 shot; HARRINGTON RICHARDSON single shot .410 shotgun; REMINGTON 870 12.ga shotgun; HENRY lever action .22 long rifle; UNIVERSAL .30 cal M1; STORM RUGER .223 cal mini 14 w/box, semi auto; REMINGTON Viper .22 rifle; RUGER 10/22 .22 cal. semi auto w/scope; MARLIN Model 60, .22 cal. KNIVES: Pocket knife collection, tactical knives, CASE, S&W, BROWNING, BUCK & More! CRAFTSMAN top & bottom tool chest, CRAFTSMAN stack rolling tool chest; LOTS OF HAND TOOLS; ladders; Storage Building: Shingle roof dbl door out building; TROYBILT rototiller; DR trimmer; wheel barrows; scrap iron; wood & steel fence posts; bridge embarnkment limestones; feed bunks; livestock supplies; TROYBILT riding mower.